Buy your own IPD plenum for your Porsche 997.1 Carrera and see the smile it will put on your face. If you want loads of power with one easy performance part, this IPD Plenum for your Porsche 997.1 Carrera is perfect for you! 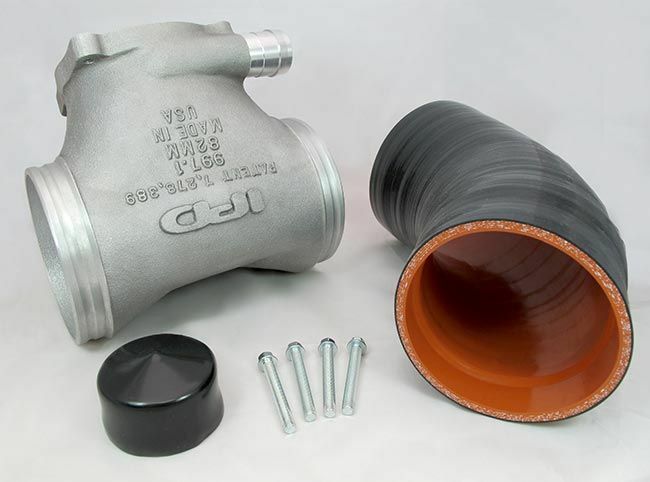 This IPD Plenum replaces your stock intake and easily bolts right up to your stock throttle body. Your stock intake is very inefficient; shaped like a T the air passing through hits a wall and slows down. With IPD's patented Y shape plenum the air is evenly cut, increasing air flow. The IPD "Y" design plenum replaces the factory "T" style air distributor and provides substantial power and torque gains by means of a more efficient design. Horsepower gains range from 24 to 28 depending on engine displacement and engine condition. These max power gains are experienced in the mid range where is it most useable and enjoyed. 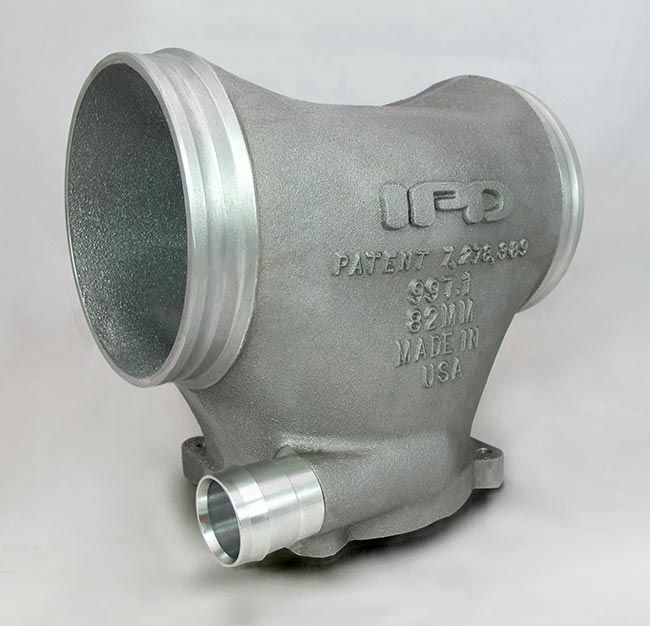 All of the IPD "Competition" Plenums utilize the next largest size throttle body offered by Porsche. In this case, the Competition Carrera upgrades the factory OE 74mm throttle body with Porsche's 82mm 997 GT3 throttle body. 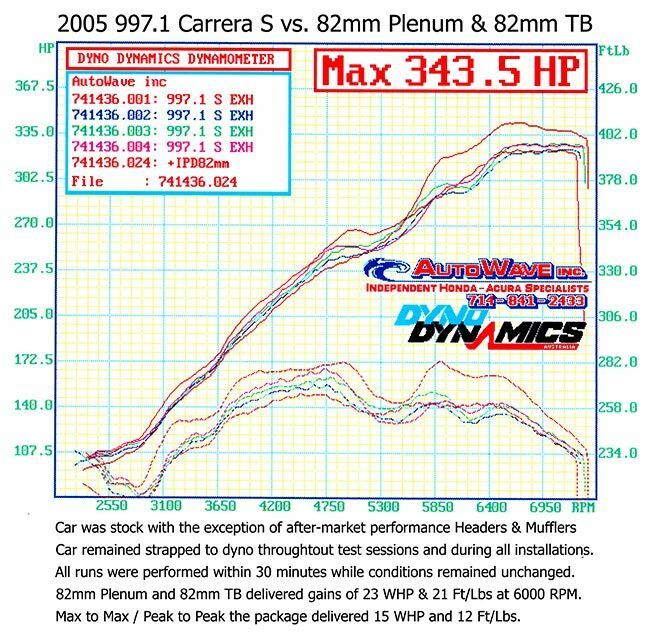 All of our Competition Plenums are designed to perform with cars equipped with high performance exhaust systems. The more extensive the exhaust system (headers, kats and mufflers) the better. Optimizing air intake and exhaust together creates a balanced performance package that allows the engine to inhale and exhale more air thus creating more power and torque. Professional installation is recommended, however a mechanically inclined Porsche owner will be able to install this IPD Plenum themselves. Installation is pretty straight forward, the IPD Plenum connects directly to your stock throttle body.